Download Word Recovery Tool: Download demo version to know the working of software. Demo version is the combination of selected features and display to preview of recovered data. 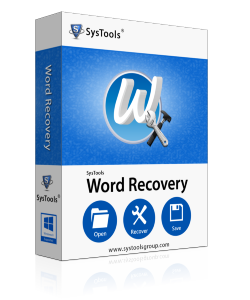 Purchase Word File Recovery – starting price at $45: Word Recovery is an easy & simple to use and provides on screen display of Doc File Recovery process. To get the complete features of software, purchase licensed version of software. Searching for the optimum first aid solutions to treat corrupted and damaged Word documents and templates? We will provide you with complete MS Word recovery. MS Word is the most popular and widely used word-processing application. It’s an excellent, simple and easy to use component of the Microsoft Office Suite. With its user friendly features and customized interface approach is what makes it most popular for use in schools, offices and homes. How Corruption infects data present in Word files? But what if our important data in the Word files get corrupt or damaged due to some unpredictable reasons? Reasons can vary from a Virus attack to round-tripping i.e. when a document is converted from one format to the other and back repetitively. Corruption can also occur due to infection by a Macro Virus or accessing and copying files from a compact disk or flash disk. Some of the other behavioral patterns that corrupted documents flash are unreadable and garbage characters prompting on the screen, error messages during execution, improper page layout and formatting. The after effects of Word document corruption can lead to application crash, system hangs and crashes thereby affecting our productivity. Loss of crucial data is what is more perilous. Getting anxious over the situation and finding optimum solutions to control is what keeps striking our head over and over again. The situation can be regulated with the use of recovery software that effectively and efficiently recovers the corrupted Word documents. With markets flooded with infinite options for MS Word File Recovery, one has to make a wise choice by investing in the best and the optimum third party repair tool. Think Rationally. Invest in the Best!!! Word Repair Software is the finest choice. The Word file recovery software scans the corrupted file and extracts the information. Before exporting and saving the data to MS Word file the user can preview and check the extracted information. It completely fixes and Removes Doc File Error. The most amazing feature is that it supports text files of various formats. The repaired document can be saved in either RTF format i.e. Rich text Format, HTML or TXT format. All MS Word versions released till data are supported (95, 97, 2000, XP, 2003, 2007).